The Mets first official game at their new ballpark, Citi Field, is just two weeks away and what better way to heighten the excitement than with a preview of the unprecedented culinary revolution taking place in Flushing? The Mets opened the doors to Citi Field Tuesday to introduce the three Culinary All-Stars behind all the magic: Danny Meyer, Drew Nieporent & Dave Pasternack. 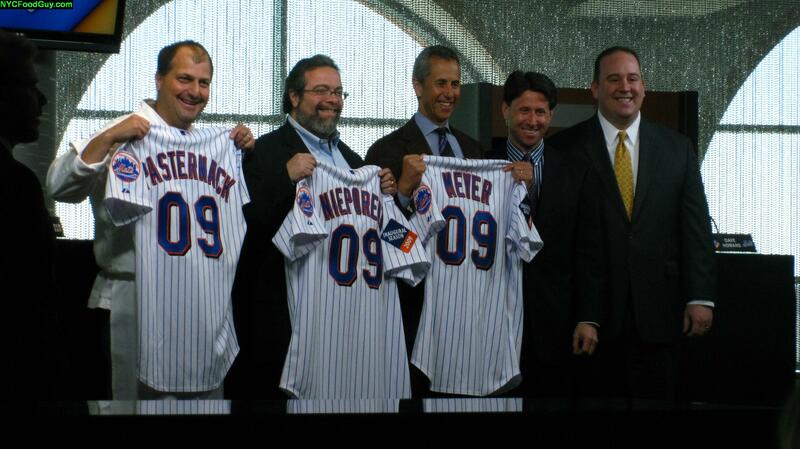 After the All-Stars received honorary Mets jerseys, a massive tasting began: tacos, pulled pork, frites with dipping sauce, Italian heroes, pizza, sushi, porchetta, mac and cheese with pancetta, skirt steak, burgers, sausage and peppers, fried fish sandwiches, cannolis, and chocolate mousse. After all that, Shake Shack’s burger, the grandma pie from The Original Cascarino’s of College Point, the Box Frites and the white cheddar mac and cheese with pancetta were my favorite bites. Stay tuned to NYCFoodGuy.com for a video preview of Citi Field food starring yours truly and Ted Berg of SNY.tv. Anyone who remembers the pizza at Shea Stadium will rejoice at the inclusion of The Original Cascarino’s of College Point in Citi Field. The specialty Grandma slice was delicious. The crisp and airy crust supported a balanced amount of fresh mozzarella, sweet tomato sauce, diced basil, and olive oil. 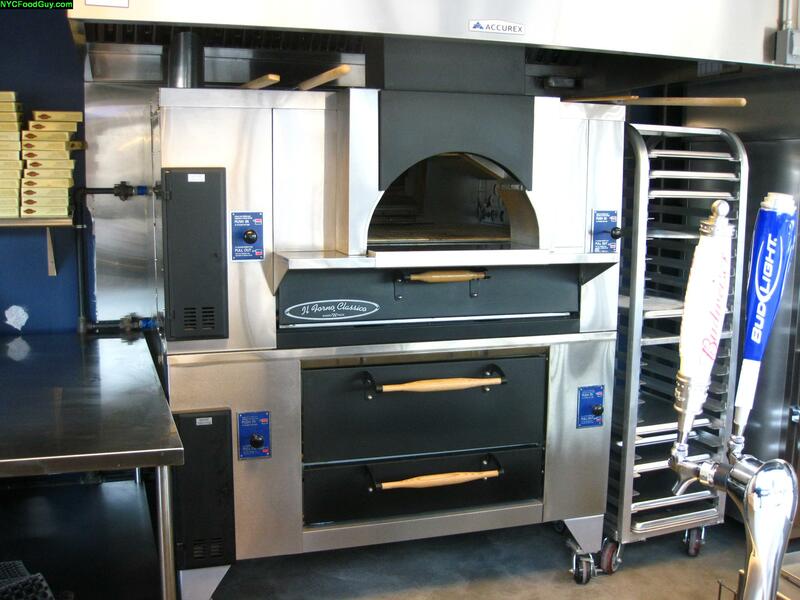 The path to a new pizza frontier at Mets games will be the use of gas-fired brick ovens for all pizza-cooking. Gone are the days of conveyor belts slowly heating sub-par DiGiorno mini pies. What you can expect is pizza that actually tastes like pizza you’d get at your local slice joint. 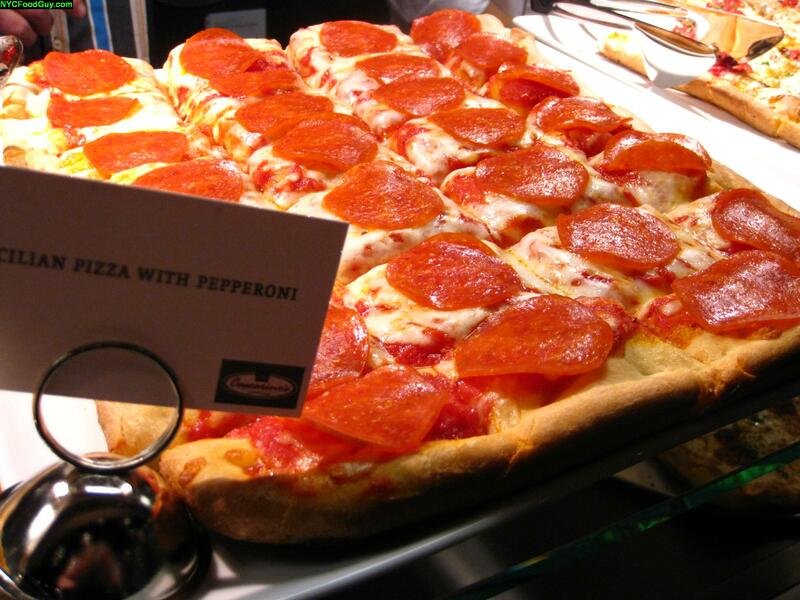 Gas-fired brick ovens will cook all the pizza at Citi Field. I didn’t get a chance to taste the Sicilian with pepperoni but it certainly looks delicious. 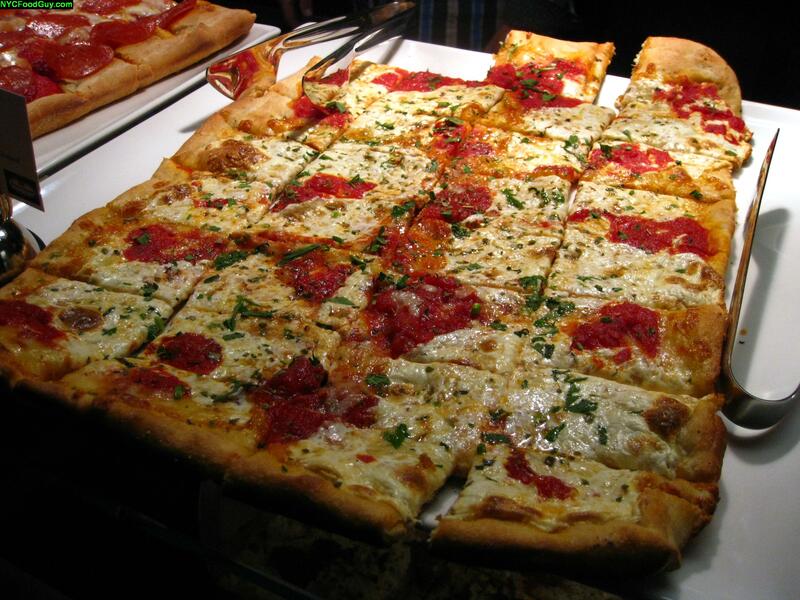 The regular slices are tasty and like the Grandma, feature sweet sauce and thin yet bland crust. The slice itself is light and a little on the small side so don’t expect one slice to fill you up. 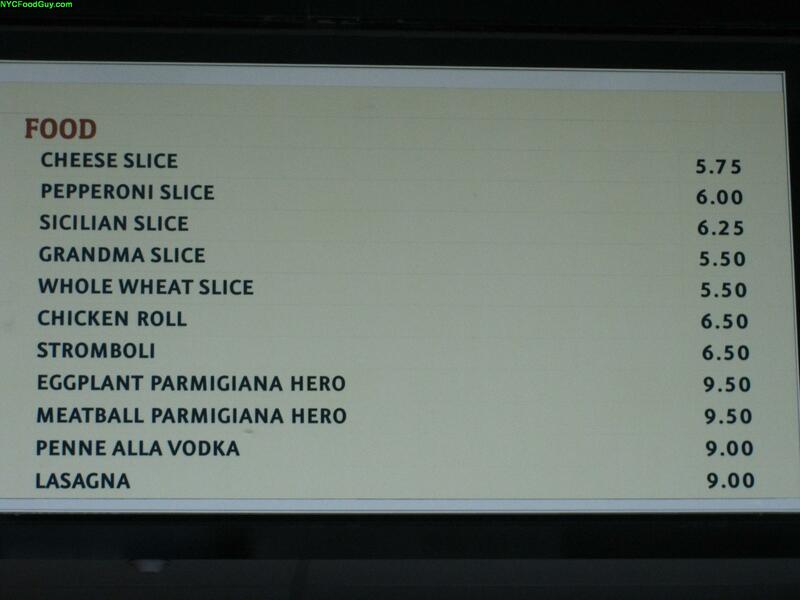 The small slices could be an issue, however, if you look at the prices below. $5.75 for one plain slice is a little steep. We didn’t get a chance to experience any of the heroes or pasta dishes, but those could turn out to be the best bang for your buck. The Original Cascarino’s Pizzeria & Ristorante of College Point is located at 14-60 College Point Blvd at 15th Ave, Queens 718-445-9755. 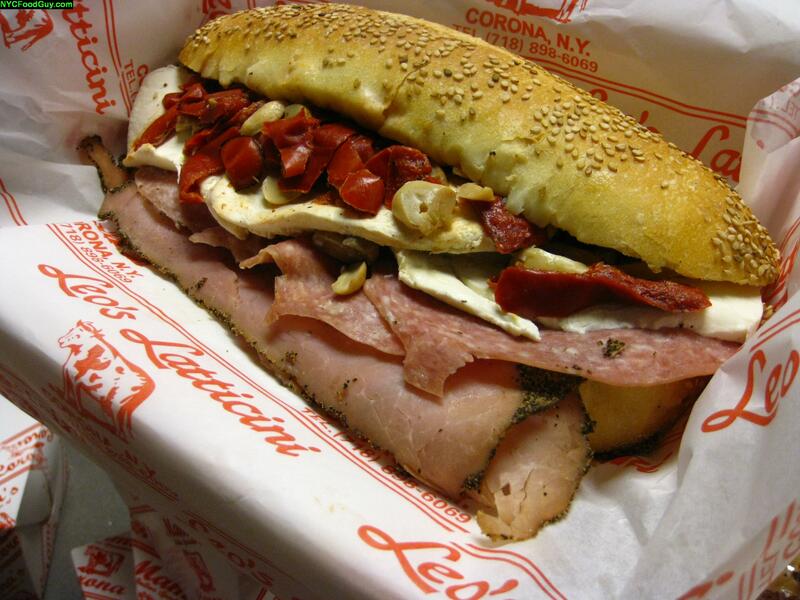 Beginning their 8th year in a Mets ballpark, Mama’s offers hefty and authentic Italian subs along with a variety of salads including an antipasto, a grilled chicken salad and a bocconcini (small pieces of fresh mozzarella). We tried the “Mama’s Special”, the signature hero, which features peppered ham, salami, fresh mozzarella, red peppers and mushrooms on a semolina hero (below). The initial impression of the hero is “fresh.” All the ingredients worked together to create a nice spicy flavor tempered every so often by the homemade fresh mozzarella. Dessert was a simple yet effective affair. 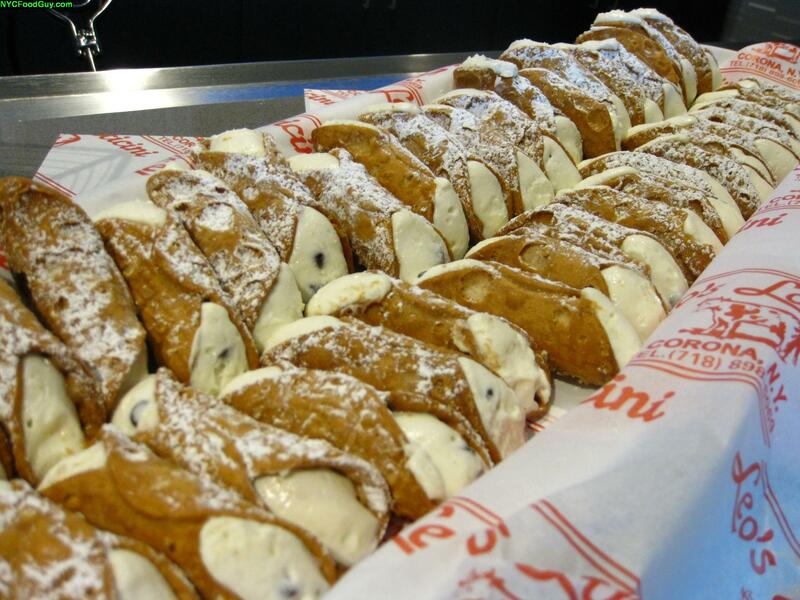 Cannolis! 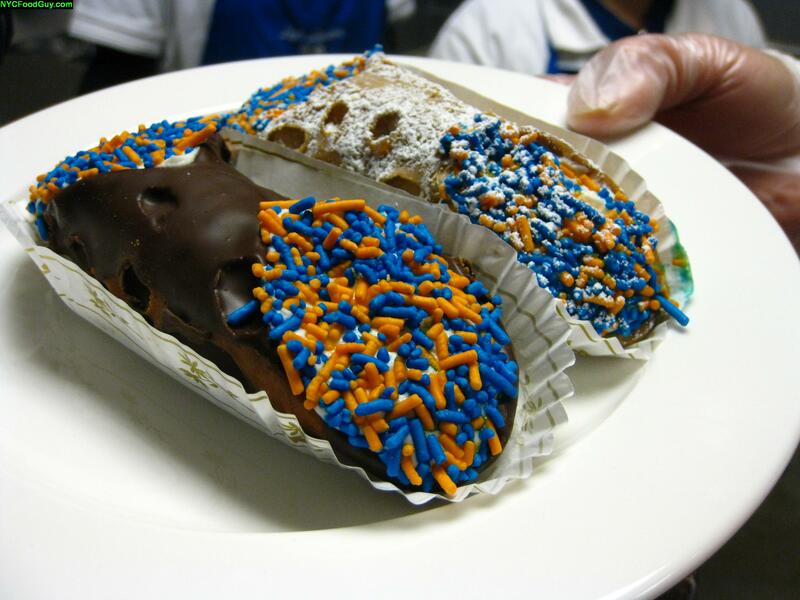 And not just any cannolis, Mets sprinkle cannolis. Now that's the spirit! I wonder if they'll taste better after wins? I didn’t taste the Mets decorated cannoli but the unadorned mini versions were fresh and surprisingly light. Some things are just not fair. Floyd Cardoz, master of trendy Indian food at Tabla, went on a serious hunt before finalizing his taco recipes for El Verano. Only the chili marinated skirt steak was available at Tuesday’s press conference. 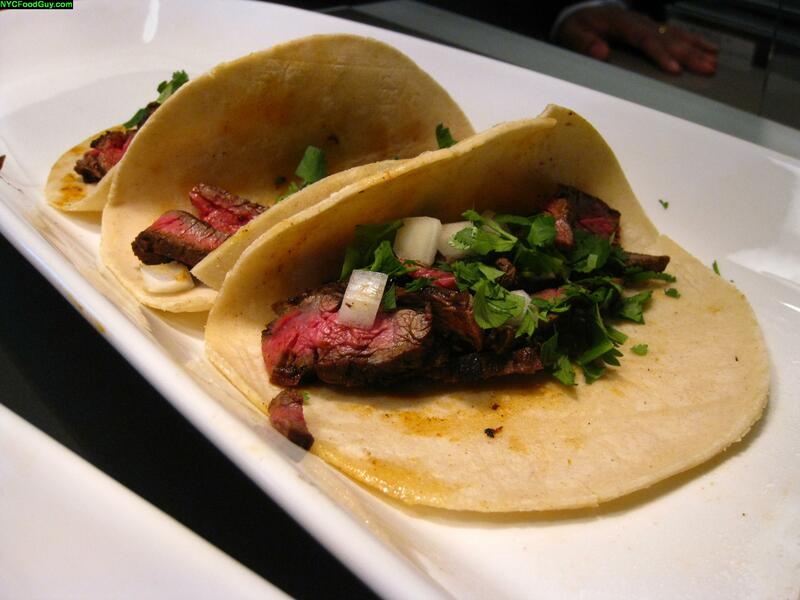 Unfortunately, as tasty as the char-broiled, rare skirt steak was, especially with the roasted tomato salsa, I was very unimpressed by the generic steamed double corn tortillas. There will also be “elote” corn on the cob ($3.50), which is steamed corn on the cob brushed with mayo and sprinkled with coteja cheese and cayenne pepper. Delicious Mexican street food. If you like booze with your Mexican food, Brooklyn Brewery has created a special beer called “Sabroso Ale” with hints of cinnamon and orange ($7.50). VALUE BUY: Each individual taco is $7.25, but you can get a three taco combo featuring each of the three finalists for just $9.75. When the regular season rolls around, the pulled pork sandwich on a brioche bun ($9.00) will be joined by $10 Kansas City Ribs & $8 Chipotle Chicken Wings. Strands of fatty, tender pork hung from the sides of the sandwich I ate, the pink hue a sure sign of proper smokage. The slightly sweet brioche bun was a good complement to the pork. Drew Nieporent’s Myriad Restaurant Group will be offering a seasonal three course $48 prix fixe menu at this “next generation Diamond Club.” While this is a great deal for the quality of the food you’ll be eating, you may wonder who would spend that kind of cash on food at a baseball game.? Well, access to the Acela Club is limited to premium ticket holders who will only be able to dine there by reservation (call 718-565-4333). 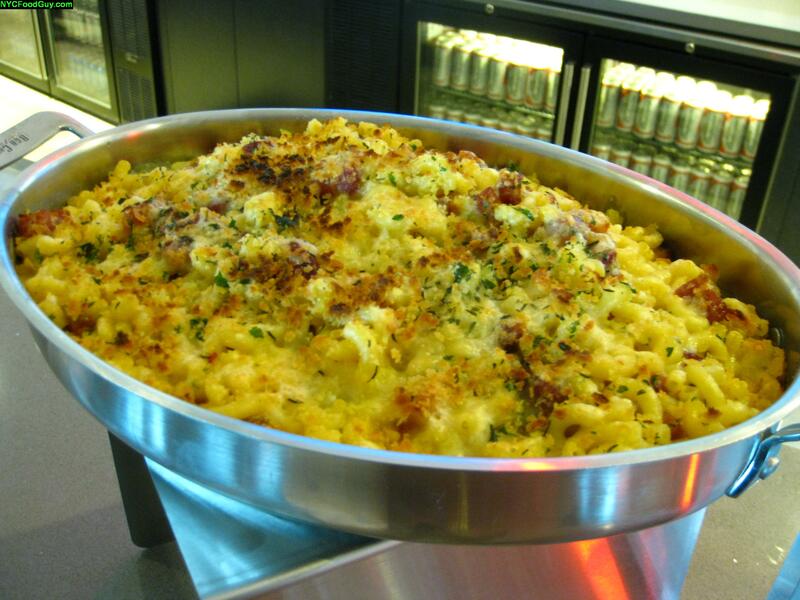 I tried two of the Acela Club’s three dishes offered at Tuesday’s press conference, starting with the white cheddar macaroni and cheese with pancetta. This was one of the tastiest dishes at the event, combining textures, with the crunchy bread crumbs and creamy cheddar, and flavors, with the slightly spicy pancetta and the sharp cheese. The heritage pork porchetta, a spit roasted, marinated pork loin, wasn’t as tasty or tender as the East Village version. Like some of the other dishes, the porchetta suffered from cooling down. Since 1998, Daruma has provided their delicately crafted sushi to the Mets. NYC Food Guy is already not a big sushi eater, and I’m even less inclined to eat it at a baseball game. Regardless, credit should be given to Daruma for their newest creation: The Citi Field All Star Shimp Dog (not pictured), 100 percent pure shrimp in natural casing served on a roll topped with a special sauce. A beautiful presentation, yes, but at a baseball game? When all was said and done, the Shake Shack’s burger combining brisket with chuck and short rib, was the tastiest bite of the day. The perfectly charred salt and pepper crust revealed a juicy center which blended with the fresh romaine lettuce, tomato and famous mayo-based Shack sauce. Sandwich it all between a buttered and grilled potato roll, creating an almost croissant like flavor, and you’re in burger heaven. You’ll have the option of ordering a single Shack burger ($5.75) or a double ($8.75), each priced ony $1 higher than at the actual Shake Shack. The Shack-ago dog ($5.75), the New York Dog ($5.00) and the Bird Dog ($6.00) will also be served along with Shake Shack’s fries ($4.75) and cheese fries ($5.75). The popular frozen custard offered at the real Shake Shack will also be served but only in chocolate and vanilla. Danny Meyer offered an intriguing modification, suggesting the addition of a shot of espresso to a vanilla frozen custard. This guy really knows what he’s doing. If all this fancy food is too much for you to handle at a ball game, fear not, “Ballpark Eats” offers Nathan’s Hot Dogs, fries and onion rings, two types of Brooklyn Burgers, chicken fingers, corn dogs, peanuts, and cracker jacks. Tuesday, The “Drive-In” Burger was the most intriguing option amidst the hot dogs and chicken fingers. It features a Brooklyn Burger, grilled well done, covered in American cheese, Russian dressing and dill pickle slices. Great in concept, not as tasty in execution. The Russian dressing and dill pickles saved the overcooked and flavorless burger. Catch of the Day – Dave Pasternack, Executive Chef at Esca, is behind this seafood shack in the “Taste of the City” centerfield concourse. A fried flounder sandwich offered at Tuesday’s event featured a crispy piece of flounder on a potato bun. It was a little dried out from the heat lamps but tasty nonetheless. The fish shack will also serve a blackened shrimp po’ boy ($12.75), which Mr. Pasternack guaranteed will “shoot on your shirt.” The $17 Lobster roll is the highest priced item followed by the $14.75 Shrimp cocktail salad. Mr. Pasternack continued to cause controversy by claiming that his “Bayside Fries”, topped with smoked sea salt, Old Bay seasoning and accompanied by sharp cheddar dipping sauce, “will become legendary.” I’m willing to investigate that claim. Box Frites – Robb Garceau is behind this frites factory located in the “Taste of the City” centerfield concourse. The fries are a little thicker than diner style and were delicious when fresh out of the fryer. Serious Eats.com’s Ed Levine posed a great question to Danny Meyer about the challenge of serving fresh, hot frites to all customers. Mr. Meyer responded curiously, noting how Mr. Garceau had previously thrown away fries that sat for more than 2 minutes. Interesting. Also of note were the sauces which will accompany the fries. I’m a ketchup man through and through and the creamy bacon sauce underwhelmed me enough to uphold that principle. Let’s take a moment to review which Culinary All-Stars are responsible for each concept. The Acela Club – Drew Nieporent (Owner, Myriad Restaurant Group, renowned for Nobu & Tribeca Grill). Michael Sobelman, formerly chef de cuisine at Tribeca Grill, will take over Executive Chef duties at the Acela Club. Shake Shack, Blue Smoke, El Verano Taqueria, Box Frites & the Delta Sky360 Club – Danny Meyer’s Union Square Hospitality Group (USHG). 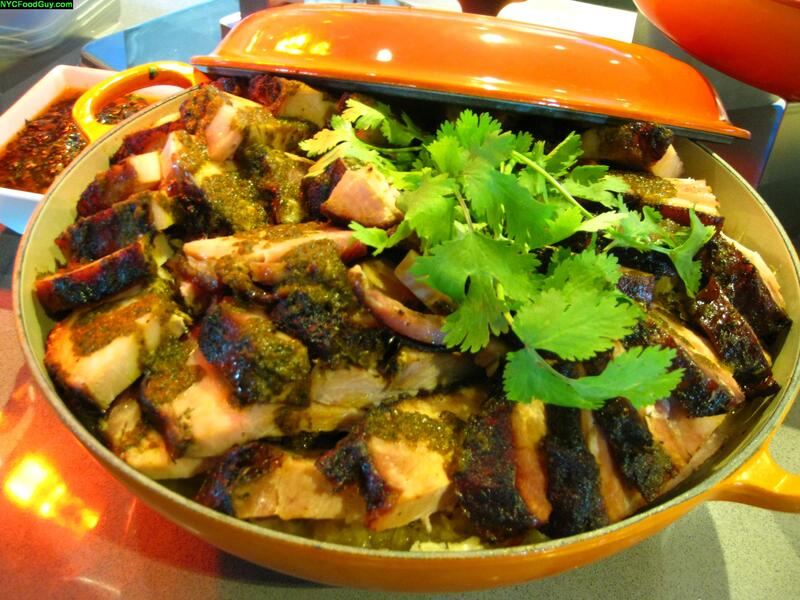 Blue Smoke’s pitmaster Ken Callaghan’s recipes will be utilized at Blue Smoke, Tabla Executive Chef Floyd Cardoz is responsible for the taco recipes at El Verano and Robb Garceau, executive chef of USHG’s catering wing Hudson Yards, created Box Frites. Executive Chef Craig Schantz will oversee the Delta Sky360 Club. 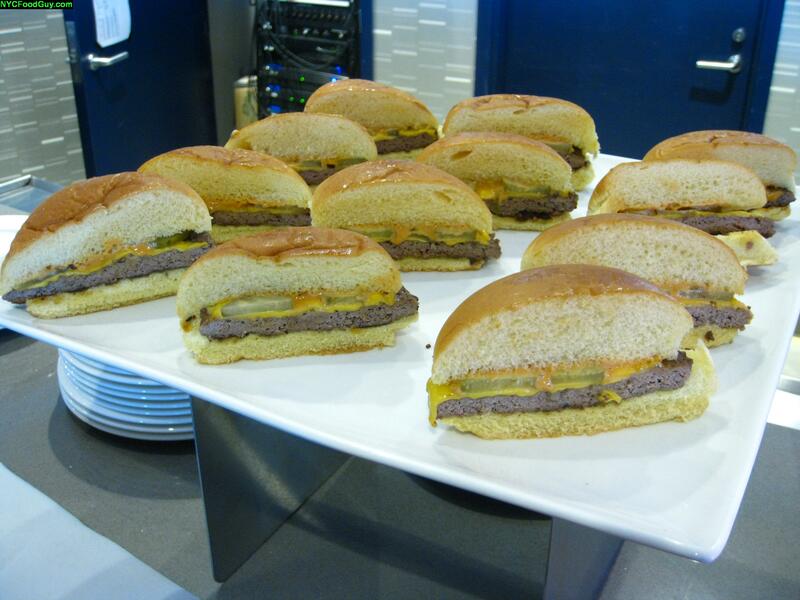 Very impressed with your preview of Citi-Field food, and I’m not even a baseball fan. How did you get the inside scoop? 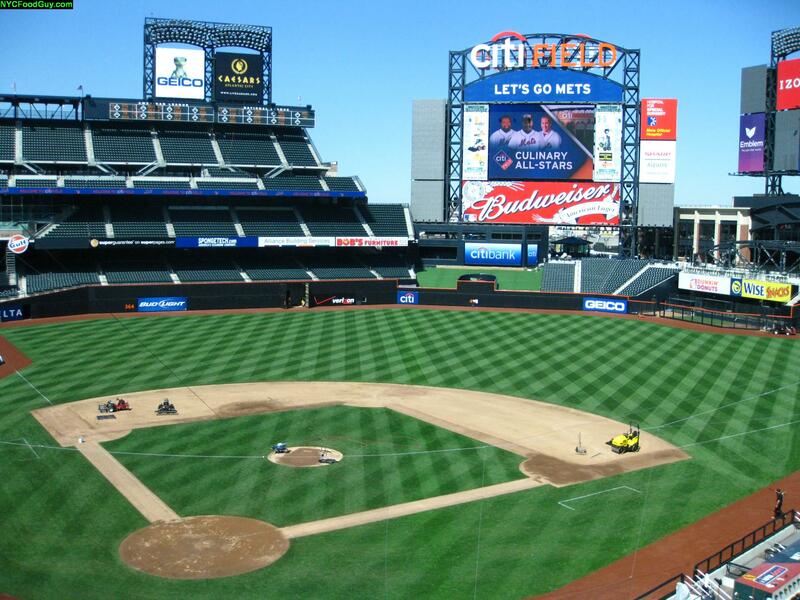 Take me out to the ballfield…..CitiField…Let’s Go Mets..
Can’t wait to eat and watch the Mets WIN!!!!!! Nice work and good to see you back! Were you on vacation, maybe at a spa eating 1,000 calories a day in anticipation of the baseball season and all the time you’ll be spending at Citi? Thanks for letting us in on this. LETS GO METS! fantastic…its 9:45am and I want pulled pork. I guess thats not too abnormal. one more thought – as a former great neck resident, you don’t give Daruma (noticed I capitalized Daruma because its about the best sushi i’ve ever had) or Yoshi a Great Neck shoutout? Amazing write up. Yay for Daruma and Yoshi from Great Neck. Best Sushi Ever. I shall be checking the diverse culinary at CitiField this season. Definitely appears to be a step up from the Hebrew National Franks and soggy Nathans crinkle cut fries of Shea long ago. Sounds great in theory, I’m curious about the execution. How long will it take to get to these places, deal with the lines & get back to my seat? In the same inning? I fear I’ll never get beyond Ballpark Eats, though isn’t there supposed to be an improved setup for watching the game while you’re gettin’ the chow? Enjoy the food while you lose the division – AGAIN! Cheesesteaks are better than pizza anyway suckaz! solid write up cuz. where’s sny vids? I was lucky enough to be included by SNY. Keep your eyes peeled because soon I’ll post a video piece on this event! Told ya I’d be back big time! Thanks for the love. Amen to that. I like your positivity. I couldnt have said it better myself and yes, I’ve definitely been stocking up on bloggable items during my brief albeit unwarranted hiatus. If you had to choose something from this post to eat at your first game, what would it be? You’re a wise man. I ran into Yoshi at Monday’s event and let him know how much I appreciate him introducing me to a Japanese woman’s bare chest. He was loving it. Ha true words from a true Great Necker. Which food item on this post intrigues you most? You’re very welcome. I’m so happy to see them turning the page on all that crappy food. I agree with your concerns and while I have no exact answers, Danny Meyer was optimistic at Monday’s event that everything will run smoothly. Unlike Shake Shack in Madison Square Park, the venue at Citi Field will have at least 7 registers working at once. That should be key to speeding things up. The best part of it all is no matter where you are in the stadium, you can see the game directly or on one of the hundreds of plasma TVs all over the building. Someones always gotta rain on the parade. Take a page from Sports Illustrated and realize the Phillies reign is over. How do you plan on winning the division without Cole Hamels. You know he’s not staying healthy all year. I hope Raul Ibanez can pitch. Thanks man, SNY’s vid will be up soon. It’s being edited, stay tuned. FG- welcome back. Thought you turned vegan. Good job on this- thorough. Now I have a reason to head to Flushing. K-Rod will stink but at least Danny Meyer did his job. I’ll admit that the Mets definitely take top honors when it comes to food. Yankees tried to be too super star status. I’ll take a ring over a shackburger any day. Well, most days. Thanks for the update–looks delicious! Love the site, too. What a spread! Great write ups and photos. Can’t wait to savor the Citi Field experience. After discovering (well truthfully being referred to your blog) and enjoying your many fine, detailed posts and pictures, I would like you to know you are on my short list for potential baby daddy. Congrats, well up the reviews – myself and the future baby are looking forward to them. amazing, Ive gained a ton reading this. Love your descriptions!!!! Pancetta is not spelled with an H.
In re: food lines, I went to CitiField last Sunday for the St. John’s game. While they didn’t have all of the food items noted above, and the crowd was not huge thanks to the bad weather, the overall concession experience was a million times better than at Shea. The Blue Smoke/Shake Shack lines seemed to move briskly–since this is in the outfield area, I’m guessing it’ll be the most popular. Same went for the Taco/Belgian fries stand directly behind the scoreboard. Going again tomorrow for the Sox game (barring rain), which should be a better gauge of the true experience. But I liked what I saw in this regard last weekend. Shame you didn’t get to taste all the beers, from what I can gleem, some of those are Citi Field exclusives. Over-priced and uninspiring…i wouldn’t expect much visiting them…let alone at Citi. This must have been a fun post to research! HA! You’re nuts! Vegan???? NEVER! Thanks for the kind words though. The food here is out of control, I mean for a ballpark, the quality and variety is unheard of. All these people who are saying, oh just give me a hot dog and a beer or the old chicken fingers are a little misguided. I understand how baseball is a pure experience but it’s okay to get excited about the fact that the Mets not only have one of the nicest ballparks in baseball but they have BY FAR the best food in MLB. Now on to this K-Rod talk, where’s the negativity coming from? And what ring would you rather have than the shack? You’re very welcome, thanks for stopping by. Come back again soon and see some more deliciousness. Any Park Slope recs for me? Thanks! It’s going to be pretty wild out there. Great food and an unbelievable ballpark. Kind of surreal that it belongs to the Mets. You’re officially out of your mind. We’re not flooding anything. You heard Sports Illustrated, the Mets are going to win the World Series. I like it. Well, those are some VERY kind words. Care to send me a photo? Thanks! I’m glad you like it and I’m even happier you learned from it, that’s the goal. When are we meeting up at a game? Thanks for the heads up, duly noted. Thanks for the update on the status of the lines, I’m not too worried for one reason: You can see the game from wherever you stand either through all of the open space or on one of the hundreds of plasma TVs all over the stadium. I’m pumped. You said it. It seems like we need to taste it all at once! Tickets may be hard to come by this season so maybe it is best to eat it all, plus you only live once! I couldnt agree more though, if the Shack burgers taste how they did Tuesday during the season, everyone will be a happy camper. I’d rather wait for one at Citi than in Madison Square Park. Not all the beers are ready to go but the Shake Shack will have “Shackmeister Ale” and El Verano will have “Sabroso Ale.” The Sabroso will have hints of cinnamon and orange, interesting. Other beers are in the works for Box Frites and Catch of the Day. All will be made by Brooklyn Brewery. Very solid. What’s your favorite BK Brewery beer now? Thats an interesting history of Cascarino’s, thanks. This Cascarino’s is just the College Point spot, apparently the owner sold the rest of the locations. 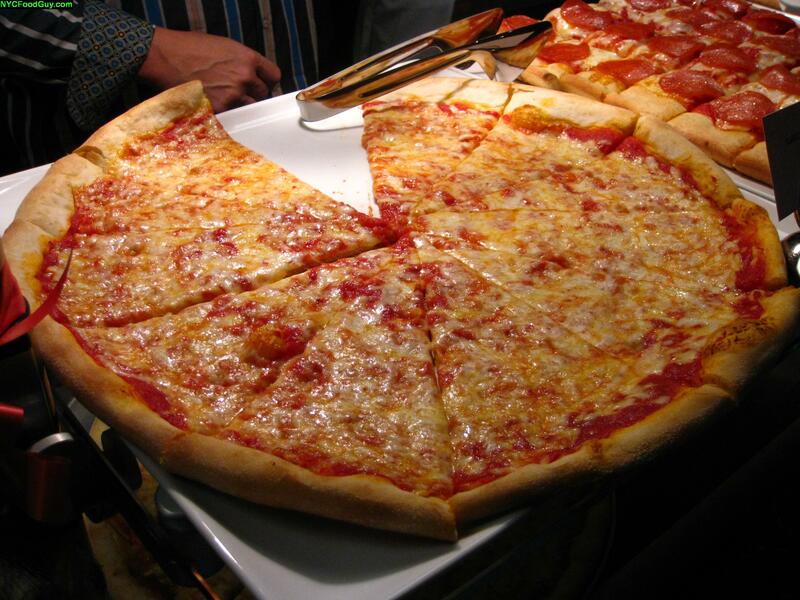 What’s your #1 pizza spot in College Point? The pizza we had the other day was pretty great though and it was made in a gas-fired brick oven. Was that how it was in College Point? You know it! What would you get first? I have to pick just one? The Chocolate Stout is excellent..nut brown may be my favorite though. Or East India. but I actually haven’t had Shackmeister or Blue Smoke’s yet. that Sabroso one sounds good too. I’m aiming to try one of them Saturday. maybe two. My seats are the last infield section in the Promenade, which is real close to that food area. How’s the sausage and peppers? Where’s the love? How about setting up an “Ollie’s Tacos” stand? Those things would sell like WILDFIRE!!! Wow, all of that looks really tasty. I don’t even know where to begin, aside from not really liking sushi (although my sister swears by Daruma). As a Yankees fan, I can only hope our new home has such good options for the fans. Good bbq and legit fries like you describe for Citi Field would be a nice start! In fairness, I did enjoy the Goya-branded stand in the old stadium’s food court- really good chicken or pork with beans/plaintains/rice (the NY Times also gave it nice marks last year). Awesome report (and sampling festival)! Sadly, I bet the lines will be huge. But I will nevertheless have to check some of these treats out. Lawrence, my crappy March is finally over, so I’m ready for WingQuest–The Continuance when you are! Been idling at 1849 periodically when I get a jonesing. GOD is a met fan! the beer at Box Frites, Blanche de Queens, is excellent. Tastes pretty much like a white ale. flavorful, fullbodied. excellent. I want another. I just wanted to correct you on a mistake I noticed on your taco review. I went to the past few games and they serve 2 tacos for the $7.25 not just one. My wife ordered a set of the steak tacos, while I had a pulled pork at blue smoke. The tacos were so good that we ordered another round. While the pulled pork was really tasty, it wasn’t as big or filling and therefore not the better deal for $9. All together I give the whole outfield area, that has the bluesmoke/verana/box frites/ shake shack stands a 9 out of 10. I take off one point for the long lines! Great post. I challenge you to embark on a sushi-eating adventure. Who knows?Maybe finding inexpensive, good sushi could be the next frontier for you once you digest all that meat! Wow food guy, you ROCK! 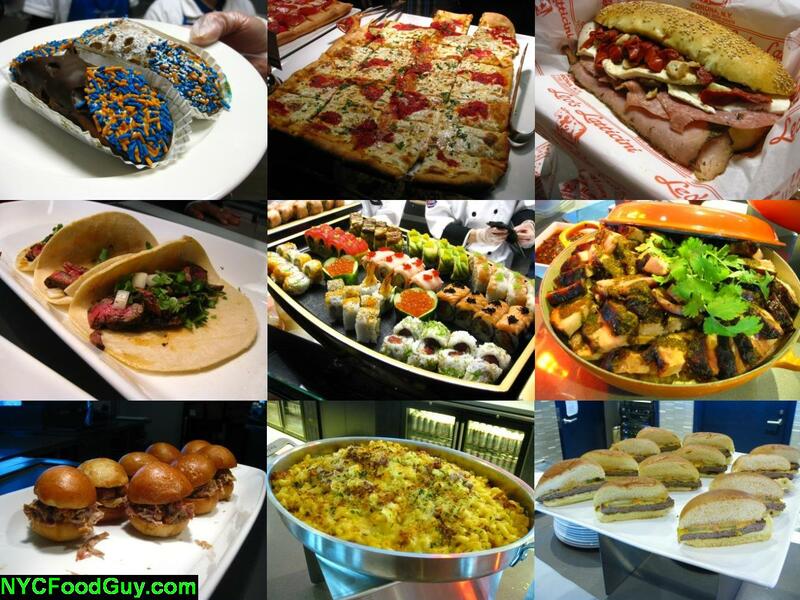 What an awesome review of Citi Field food – and as a huge Mets fan and a huge NYCfoodguy.com fan, it was perfect. I heard about Yankee Stadium’s food from Yankees fans who called into WFAN who checked it out already and they were all disappointed and it sucked, on top of being overpriced. One guy said they sell “Frickles” – Fried Pickles – for 8 BUCKS. Insane. That gets me a Premio Sausage sandwich at Shea – well, now at Citi. By the way your partner dissed the sausage, but the Premio Sausage carts at Shea were the BEST Sausage & pepper sandwiches I’ve had just about anywhere. To think that a classic like Shake Shack is now at Citi, wow, I can’t go wrong with eating there. The cannolis look awesome w/ blue and orange sprinkles, the grandma slice looked great, the fish looks good, I want to try the drive-in burger, the sushi looks awesome, but where’s the report on the frites??? Maybe I missed it, but i’m curious – is it Pommes Frites that opened vending in Citi? I never caught the name of the place, it was hard to hear. LETS GO METS!!!! Hey Food-Guy – Ecellent presentation. I loved the video. Looking forward to the pizza and baseball at Citi. One question – how was the ketchup? i’m headed out tomorrow night for the opener and know exactly what i’m gonna have thanks to you! I was at the Mets opening game. 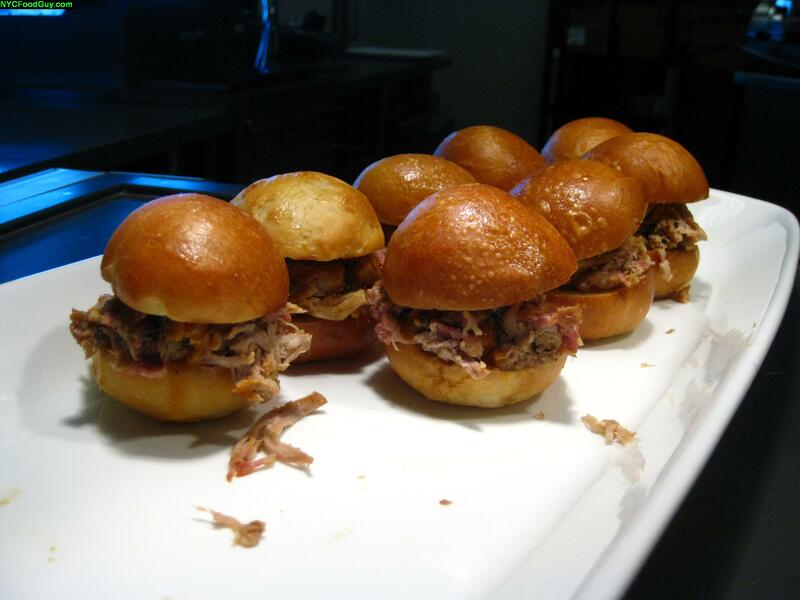 I followed your recommendations and enjoyed the eating experience at Citifield…..You certainly know how to deliver top notch food reviews….Loved your video from Citifield.. But what about the Mets? They didn’t deliver an opening day win??? ……You Gotta Believe……Let’s Go Mets……. Lines will be long because we’re cranking 40,000 people through. But not as long as at Shea, because this building was designed to produce great food. There are more kitchens, and they’re closer to the fans. I went to the second game at Citi last night. I did not see this article before now however. I went to the Taqueria, they were very good and I cannot say enough about the Brooklyn Sabroso ale served there as well. A truly great beer. I’m headed out east from LA to see the Mets and Dodgers in July. Got my tickets with access to the Acela Club and I can’t wait to try all the food! Is the Acela Club like the Dugout Club at Dodger Stadium? That is, free food? Matt, It’s not like the Dugout Club. For evening games, the Acela Club is $48 price fixe. It has a high end antipasto buffet & then you order your entree off the menu. The Delta Club is more like your Dugout Club. What seats come with access to the Delta Club? I wasn’t as impressed as I thought I’d be. Of course the Shack Burger was on point, but the lobster roll was sub par. Still better than Yankees food, but I expected better. Talk to Omar and tell him to step his game up. CitiField Update: Even though the Citifield logo looks like Domino’s Pizza (they really didn’t pay someone for this! ); go for the ribs at Blue Smoke. King of Ketchup swears by this mini rack and told me that he is barely able to finish one $10 order. Of course I can’t believe this as anyone can eat more than 5 ribs. He was right! Big, beautiful, and deliciousy. While I was in line, one of the “chefs” told me to ask for extra rib bbq sauce. The pumped stuff is for the pulled pork. The line moved quickly and this meal was worth the tenner. All the food above seem to so good. Is all of them are healthy food? The NYC Food Guy doesn’t like sushi? How can you not? This means that you haven’t checked out Amber in the West Village yet. 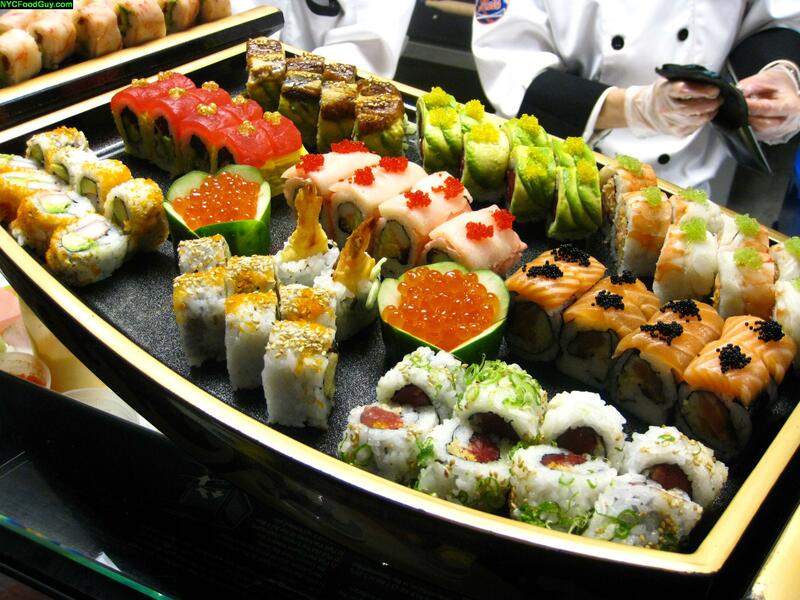 Delicious, mouthwatering sushi in a great environment – seriously try it buddy! What’s better is that you can get $40 worth of food and drink for only $20 on BuyWithMe NYC. Here’s the link http://bit.ly/c28ybG you better try it!